This touching story starts when Bobby is just an infant, in a household that includes his parents and grandfather. As Bobby learns to walk, it is his grandfather who teaches him. "Hold on to my hands, Bobby," his grandfather said. "Now one foot, now the other." And this begins the close and tender relationship between a boy and his live-in grandfather. This young-old duo learn many things together through a favorite game of stacking blocks, storytelling and much playtime spent together. As with many children, one of Bobby's favorite activities is to ask for his grandfather's stories about when Bobby was younger. Grandfather tells how he held Bobby's hands and says, "Now one foot, now the other. And before you knew it…"
The affection and closeness between the two characters will be familiar to many children. Unfortunately for Bobby, and some children, Grandfather suffers a stroke and is hospitalized for many months. Bobby is confused and lonely, but the time finally comes for Grandfather to return home. His parents try to prepare Bobby for Grandfather's physical limitations, but Bobby is unsure, hesitant and even frightened by his grandfather's inability to walk, eat or talk. With time, the boy discovers a glimmer of recognition in his grandfather's eyes. Bobby gets out the old blocks and begins to perform their familiar stacking game, doing all the talking himself. Grandfather smiles and moves his fingers up and down. Now Bobby knows that his grandfather will get better. Author De Paola describes the attention and tender assistance that now 6-year-old Bobby shows his grandfather. As spring arrives, the two go outside, and Grandfather says, You. Me. Walk." Bobby stands in front and Grandfather leans on his shoulders. "OK, Grandfather. Now one foot, now the other," says Bobby. And so the year continues with Bobby taking care of the physical needs of the two, and the relationship deepens. Now Bobby is proud to tell him the story of how he taught Grandfather to walk. This book is simply illustrated with blue and brown drawings that don't overshadow the important story that is taking place. Bobby's physical growth is evident from beginning to end, but his understanding and acceptance of the situation is the important growth of this story. Children will be comforted by this story of an unfortunate, but frequently common, turn of events in this family's situation. The grandfather's impairments are not harshly presented, but neither are they hidden from the child. The boy's initial negative reactions can reassure your child that it's OK to be confused or even scared of odd behaviors caused by physical disabilities. 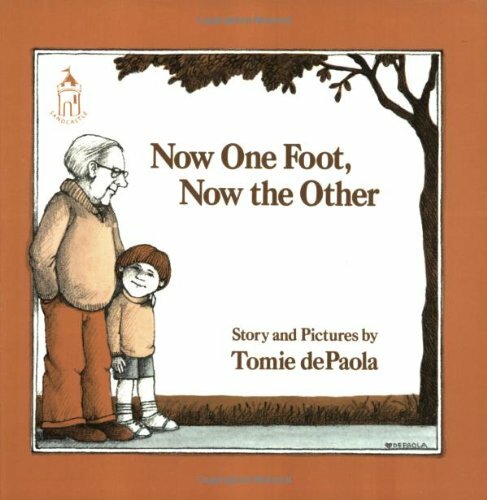 De Paola uses this beautiful story to show children that a relationship can continue in spite of some of life's unfortunate events. 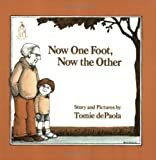 To check out this book and others by Tomie de Paola, visit the Lincoln Public Library at 725 Pekin St. or call (217) 732-5732.